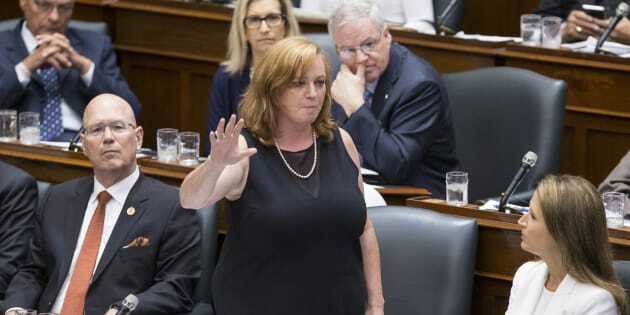 Lisa MacLeod, Ontario's Children, Community and Social Services Minister, speaks in the Ontario Legislature in Toronto on Aug. 1, 2018. An Ontario cabinet minister picked the wrong time to troll her rivals about Toronto. Lisa MacLeod, the minister of children, community, and social services, has sparked plenty of headlines lately by publicly jostling with the federal government over the costs of housing asylum seekers and scrapping the province's basic income pilot project. Early Wednesday morning, MacLeod took to Twitter to poke fun at Opposition New Democrats who are raising alarms over the Progressive Conservative government's plan to dramatically slash the number of Toronto city councillors. "Still can't find the chaos in Toronto the NDP is claiming," she wrote, with a photo of the city. "Beautiful morning in the Provincial capital." The tweet was immediately panned as tone deaf given how torrential rains Tuesday night spurred flash flooding that caused plenty of chaos for Torontonians. What's the address of the rock you live under? Tone-deaf tweet of the year. Really? No well wishes? Just a partisan dig? This is the best you can muster? Pretty sad. There are flooded basements. People had to be saved. Seriously, why would this be your response? Some responded by sharing news stories, including a terrifying tale of two men who nearly died trapped in a flooded elevator. Others shared their own dramatic stories and videos. Sorry? Last night I was helping my apartment building get water out of the basement before cars were flooded. And I witnessed a man get hit by a fire truck due to lack of visibility. Go talk to our emergency service people, get the story right, and apologize. Some shared tweets from Toronto Police Services and the chief of Toronto Fire Services who said that, over a 12-hour period, crews responded to 714 separate emergency calls. And Liberal MP Adam Vaughan, who represents the Toronto riding of Spadina-Fort York, blasted the remark as "oblivious," while taking a dig at the Progressive Conservative government's buck-a-beer plan. Correction: An earlier version of this story stated Adam Vaughan was the MP for Trinity-Spadina. He is the previous MP for that riding and now represents Spadina-Fort York.